Even the most finely finished floors can be damaged if not protected. We highly recommend that you attach felt disc pads (available at your local hardware store) to the bottom of each leg on all furniture you plan to place on hardwood or wood laminate flooring. As no finish is fully unscratchable, and everyday items like keyboards, pets, alarm clocks and lamps can damage your furniture's finish, it's also smart to put the same kind of felt discs on the bottom of items in regular contact with your new furniture. And speaking of your furniture's finish, remember some of the chemicals in common products can soften your furniture's finish coat and cause dents and discolorations. So read all labels before using any chemical cleaners. All upholstered furniture needs some regular maintenance. So if you want to keep that "showroom" look, plan to fluff and rotate any loose seat and back cushions at least once a week. And remember, while most casual pieces will conform to one's shape over time, you can minimize this effect by regularly fluffing the fiber or down filling and redistributing it more evenly. Also, do remember that while some of your cushions may feel very firm on their day of delivery, they will soften and settle with time. To maintain the beauty of your furniture's fabric, we recommend you vacuum it regularly. But be sure to use the correct brush attachment and ensure it's lint-free before you make contact with the furniture. Another good idea is to place furniture cups under all legs to protect your carpet and pad and ensure skirted furniture fabrics stay off the floor. Always pre-test cleaning agents in a small, inconspicuous area before proceeding. When cleaning a spill, blot immediately to remove spilled material, use a clean white cloth,work from the outside to the middle of the affected area to prevent rings and never rub or use strong chemicals or detergents. Although many slipcovers can be washed, for easier handling and wrinkle-free results, you may want to consider taking your slipcover to be professionally dry cleaned. When washing slipcovers yourself it is very important to follow the washing instructions. For specific details about how to wash your furniture, check the manufacturer's website or on the specific product page for your item on this website. We suggest that you run the washer through a wash cycle empty before washing your slipcover -- just to be sure it is free of any detergent, bleach, or other impurities that might spot or stain the slipcover. 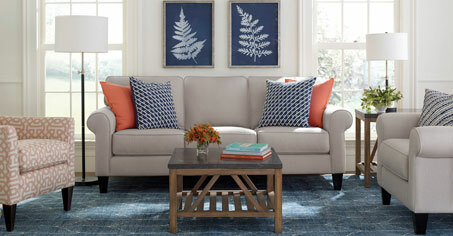 We also suggest that you wash the entire slipcover; washing only select parts may result in color variations on the piece of furniture (you may want to consider washing all pieces in the collection at the same time, i.e., wash the sofa, the chair and the ottoman covers at the same time -- again, to minimize color variations which may occur with washing). Don't overload your washer. Separate the slipcover into two loads, washing the body cover in the first load and the cushion covers in the second load. Zip the zippers (closed) on pillow and cushion covers to prevent damage when washing. Use the gentle cycle on your washing machine. Use cold water and a mild detergent. Do not use a detergent with bleach or a bleach additive. Remove the slipcover from the washer immediately at the end of the cycle. While air-drying is preferred, you can use the dryer - on the 'no-heat' setting. Tumble dry until the slipcover is just slightly damp. Put the Body slipcover back on the piece of furniture while still slightly damp - you may need to stretch it a little to get it back on. Putting the cover back on while it's still slightly damp ensures it will dry to fit. Covers for the seat and back cushions and pillows should be replaced slightly damp as well. Stand the cushions on end, rotating them every 20 to 30 minutes until dry. This will prevent any water that may drain to one side of the cushion from sitting in one place and possibly causing a water stain. All fabrics fade over time. But how fast they do so is largely determined by your fabric content, its color, and most importantly, the amount of direct sunlight your piece is exposed to. Cotton and primary colors show fading the fastest. Since fading is not covered by manufacturers' warranties and you want your fabric to look great for as long as possible, always avoid placing your furniture in direct sunlight. Sunbrella fabrics are also recommended for rooms with intense light. Fabric pilling is absolutely normal. It can be easily controlled with a fabric shaver (available at most fabric and craft stores). What's more, consistent use of a fabric shaver will actually cause the fabric to stop pilling and do so without affecting the fabric's performance or longevity. 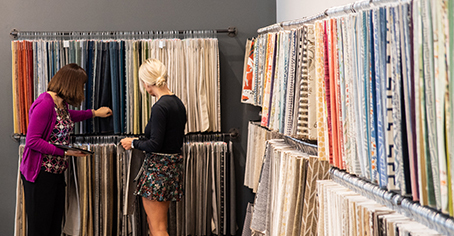 Two of our most popular and highest quality performance fabrics include Sunbrella® and Crypton. Each require a different care plan from other fabrics. One of the best ways to maintain Sunbrella® fabrics is to brush off dirt before it becomes embedded and to wipe up/clean spills soon after a stain occurs. Quicker cleanup=more easily removed. Blot (don't rub) liquid spills with a clean, dry cloth. For oi-based spills, apply an absorbent such as corn starch. Remove with a straight edge. Spray on a mild cleaning solution of soap and water. Rinse fabric thoroughly to remove all soap residue and air dry. For light to medium stains, spot cleaning can be used. Every piece of real wood furniture has its own characteristics. It expands and contracts with changes in humidity and temperature. Drawers can tighten in the summer and loosen in the winter. Its grain and color are just different enough to be unlike any other piece in the world. In short, every piece of real wood furniture is one-of-a-kind and more beautiful because of it. Heat and spills can damage the finish coat on a table. As a general rule, use tablecloths or placemats when dining, use coasters under drinks, place well made trivets under all serving dishes (especially hot ones) and always wipe up spills immediately. We recommend cleaning your wood furniture with a clean, lint-free, damp cloth. Tough, sticky spots may require a bit of hand or dish soap, but always perform a final sweep with a damp cloth. A high quality furniture polish can be applied 2 to 3 times each year, however always read the label before using any polish to ensure the polish is safe to use with your furniture's finish (painted furniture can be damaged by polishes). Always store table leaves flat as they can warp if placed on their sides. To get the most of your rug use a rug pad and turn your carpet 180 degrees once or twice a year to ensure even wear. Vacuum it regularly but avoid damaging any fringe. Never use a beater bar on a hooked rug. All spills should be blotted immediately with a white cloth and soda water. Do not rub. Shedding is normal and can continue up to 6 months. Longer yarns commonly work loose from a hooked rug's backing and should be trimmed with a pair of sharp scissors. Our mattresses do not require any rotation or flipping. All are one sided products. Some do have a head end and a foot end. This is indicated by the lack of quilt buttons on the head end. Body indentations are normal and are more evident on mattresses with plush or pillow tops. Do not bend your mattress more than 20 degrees or you may cause harm to the spring unit which is not covered under warranty. Mattress pads are a good idea for any product that lacks a zip on/zip off topper. We require all of our manufacturers to follow U.S. safety regulations in product manufacturing regardless of where the product is made. Please note: While products sold should be tip-proof—specifically bedroom dressers, tall shelving, or other large pieces of furniture—out of an abundance of caution Boston Interiors suggests using a “tip kit.” This will secure these large pieces to the wall and help prevent tipping. One of these tip kits will be provided with your furniture upon delivery. If for any reason you did not receive a tip kit, or you would like to request a complimentary kit, please contact our customer service department at 1-781-847-4600.